I often will make a large batch of quinoa at one time. Then I stick half in the fridge and half in the freezer. That way, I always have some on hand to add to meals. My husband has been trying to eat less and less grains, so we have been eating a lot more quinoa than rice these days. 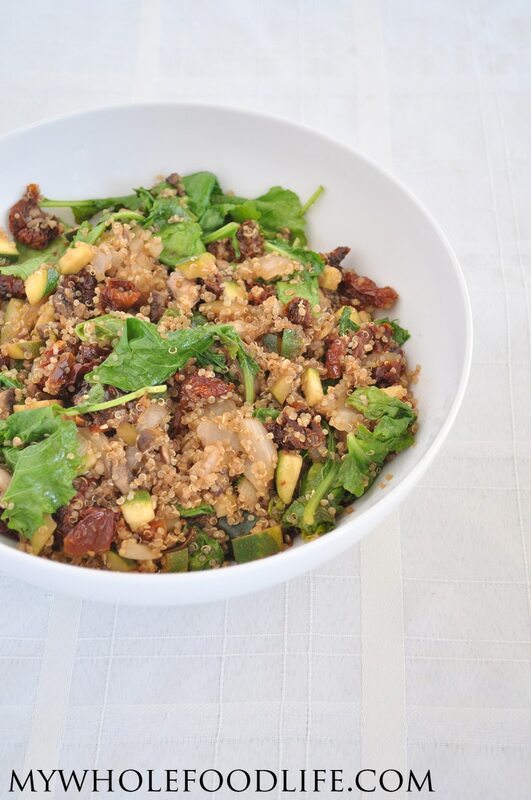 I hope you enjoy quinoa, kale and sun dried tomatoes recipe. One more thing. Have you ever tried massaged kale? OMG it is life changing! I always though kale was gross until I learned to massage it. I made this short video with my daughter to show you how. You can definitely use massaged kale in this recipe instead of baby kale. Either way would be great. An healthy meal that is packed with flavor! Place the sun dried tomatoes in a bowl with enough water to cover them. Let them soak for 30 minutes. In a large saute pan , on medium heat, add the oil, onion and garlic. Cover and let cook for about 5 minutes stirring occasionally. Then add the mushrooms, zucchini, quinoa, sun dried tomatoes and balsamic vinegar and sea salt. Cover and let cook another 5-7 minutes. Stir occasionally. Lastly, add in the baby kale and let cook another couple minutes. Just enough to wilt the kale. This dish should last at least 4 days in the fridge. You may even be able to freeze it. I haven't tried to say for sure. Enjoy! Have you thought about eliminating the oil in your recipes? There's no need for all the added fat that a Tbsp or 2 add to a dish. People can get enough fats through whole foods, and your recipes are great without it, and can be replaced by water for sauteing or even some veg broth. Encourage even better health for people, so that they reduce or eliminate the damage they are doing to their endothelial linings of their blood vessels, by using refined oil. If you haven't read Prevent and Reverse Heart Disease, by Dr Caldwell Esselstyn, I'd like to suggest the book! He explains it perfectly and has great pictures that show how damaged blood vessels can be repaired, by the elimination of animal fats and refined oils. I really didn't use much oil. Just enough to grease the pan so nothing would stick to it. I just want to point out that Olive oil is a healthy unsaturated fat. Our bodies need fats, carbs, and proteins for energy. Thank you for this recipe! I'm hoping it will be the one that opens the door to quinoa for my husband. I like that you include healthy fats in it too. Thanks Julie! I actually added some avocado the second day I ate this. Sounds weird in this dish, but it was delicious! I just made this tonight and it was delicious! I only used 1 T olive oil and I ate it with some grated parmesan cheese. Thanks for the easy, delicious Sunday night dinner! You are so welcome! I am so glad you liked it Karen! This was delish and very easy and quick to prepare. Can't beat that! I just made this. It's delicious! AND, I have an avocado to add to the leftovers tomorrow. :) Thanks so much!! Awesome! I am so glad you liked it! do you use the sun dried tomatoes from a jar with the oil? Or other ones? No. I used sun dried tomatoes that came in a bag. You can probably use the ones in oil too and skip the soaking step.